MAE SAI, Thailand -- Authorities in Thailand said Friday they will not immediately attempt an underwater evacuation of 12 schoolboys who have been trapped in a cave for almost two weeks because they have not learned adequate diving skills in the short time since searchers reached the area where they are sheltering. Narongsak Osotthanakorn, governor of the Chiang Rai region, said the health of most of the boys had "improved to normal," according to BBC News. 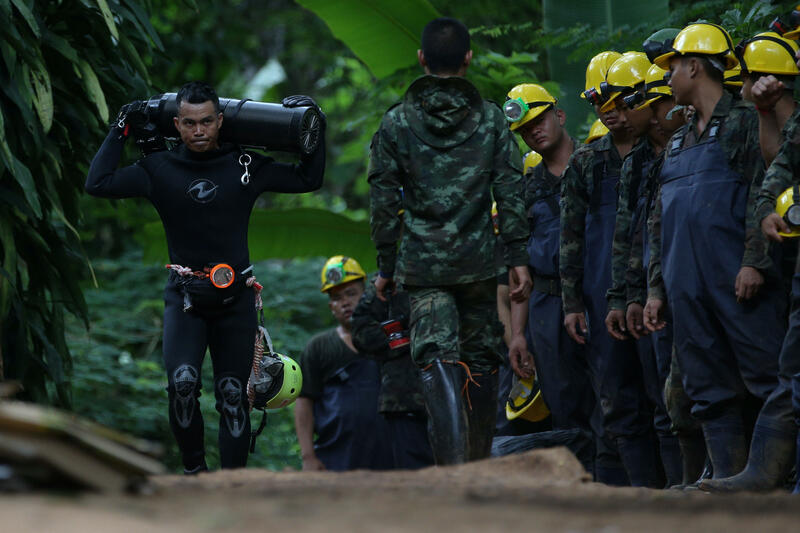 Narongsak, who is in immediate charge of the operation, indicated at a news conference, however, that if heavy rains started and appeared to be causing flooded areas in the cave to rise again, divers would try to take the boys out right away. Earlier Friday, Thai SEAL commander Arpakorn Yookongkaew said there is a "limited amount of time" to rescue the boys and the coach. "We can no longer wait for all conditions (to be ready) because circumstances are pressuring us," Thai SEAL commander Arpakorn Yookongkaew said at a news conference. "We originally thought the boys can stay safe inside the cave for quite some time but circumstances have changed." A suggestion that the trapped team might have to wait months inside until a safe way out in available -- as was the case in 2010 with Chilean miners trapped underground -- has met with little enthusiasm. Authorities continue to pursue a third option, which is finding a shaft or drilling into the mountain in which the cave is located to find a sort of back door entrance. Narongsak said the boys were still healthy and have practiced wearing diving masks and breathing in preparation for the diving possibility. According to BBC News, teams of Thai and international divers have been supplying the boys and the coach with food, oxygen and medical attention. But there are mounting concerns about the oxygen level in the chamber, which officials said had fallen to 15 percent from the usual level of 21 percent. With the oxygen levels inside getting lower as more workers enter, authorities on Friday were trying to install a 3-mile-long oxygen tube to pump in air, CBS News correspondent Ben Tracy reported.